We asked 25 of Canada's most talented food bloggers (and FBC Members) to come up with a variety of comforting and holiday-inspired recipes to showcase CW by CorningWare. In part 1, we showcased 5 sweet recipes featuring the flavours of Autumn like apples and pumpkin. Then, it was all about One-Pot Pasta Comfort. 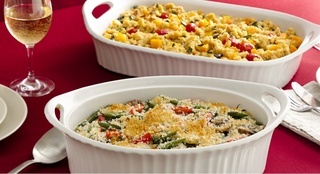 The third series in the collection was proteins and veggies for a hearty Winter meal. The fourth series was sweet and savoury comfort dishes that'll make you happy. This last series is entitled "Dinner is Served" with recipes that can go from the oven right to the kitchen tables! Recipes for the whole family to dig in and enjoy!